Approximately 1.6 million people abandon homes. Bad weather caused mud sludge and flooding. Houses and streets collapsed. The most affected prefecture is that of Hiroshima: 21 confirmed deaths. Tokyo (AsiaNews) - At least 38 dead and 50 missing because of the torrential rains that have hit Western Japan for days. Floods caused mud avalanches and flooding, destroying houses, roads and burying cars. About 48 thousand units of self-defense forces, police and firefighters are deployed in search for trapped, injured or deceased persons. Evacuation orders and notices were issued to at least 4.72 million people. 1.6 million have left their homes. The most affected prefecture is that of Hiroshima, where 21 of the confirmed deaths took place (see photo n.2). Other deaths occurred in the prefectures of Osaka, Shiga, Hyogo, Okayama and Ehime. At the moment the authorities have canceled the state of emergency in various prefectures, but they remain active in Kyoto and Hyogo. The rains are expected to continue until tomorrow. In Hiroshima, the situation now seems under control. 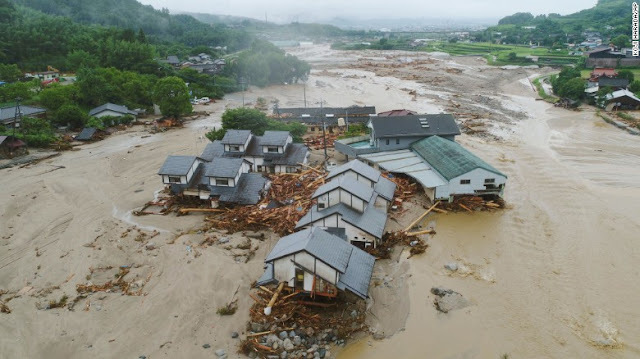 Fr Arnaldo Negri, a PIME missionary in Fukuyama, in the diocese of Hiroshima, specifies that the main problem was the overflowing of the river in some places and the landslides that dragged the wooden houses. Antonio Camacho, head of five parishes in Kyoto, said he had been stuck for four days in his home for security reasons. "A river near Kameoka is overflowing - says the missionary - and many houses have been damaged. I hope tomorrow I can celebrate Sunday Mass in the other parishes ". "The parishioners are at home and are well, thank God", concludes Fr. Camacho. "Now it's raining less. Maybe tonight they will come to Mass, I do not know how many people. We will pray for other people in other areas and for those who have lost their homes.